How do you access websites that are blocked by your ISP? Usually you might use a Proxy server or switch to a different DNS server to access the blocked websites. Since ISP’s block websites at the DNS level, switching DNS servers works effectively for accessing blocked websites and at the same time you get to utilize the full bandwidth of your internet connection. For those of you who have already tried switching DNS services manually, you know how easy it is to changes DNS addresses manually in windows. But what if you have to switch between multiple DNS services. How would you do that? Definitely switching between different DNS addresses manually would consume a lot of time. If you want to skip the wait, Fortunately there are many free tools for windows that will allow you to quickly switch between multiple DNS services. here’s the best tool for quickly switching between multiple DNS services on windows. 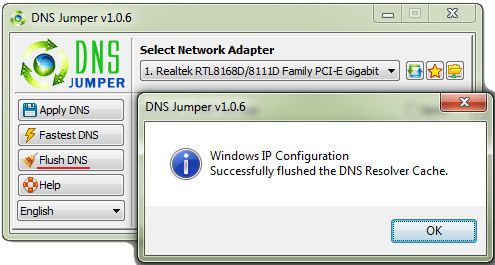 Courtesy of DNS jumper, a free tool for windows, you will be able to quickly switch between multiple DNS services. Using DNS jumper to switch between multiple DNS service is a piece of cake. You just need to select your network adapter and then choose from the list of free DNS services and finally apply the settings. Within seconds you would have switched to a different DNS service. 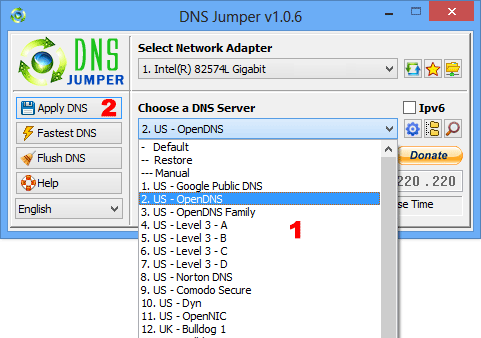 Here are the detailed instructions to quickly DNS jumper to switch between multiple DNS service. Step 1: Download and run DNS jumper with administrator privilege. Step 2: Choose a Network adapter. Step 3: Next Choose a DNS service from the list of DNS services provided and finally click on Apply DNS. Within seconds you will hear a notification sound and the DNS addresses will be update on your computer. If it doesn’t happen, you should click on the Flush DNS button to clear the DNS cache. Then you should be able to access the blocked site on your computer. In case the new DNS service that you switched to has blocked the website too, you should try switching to another DNS service. DNS jumper has another useful feature that will allow you find the fastest DNS server for your computer. To use this feature, you need to click on the Fastest DNS button and from the window that opens up, select all the DNS services that you want to compare between and click on the Find fastest DNS button. Within seconds the tool will test the DNS services and highlight the best DNS service based on your internet connection. You might expect changing to another DNS service might help you to access websites faster or access blocked sites. But in fact, this is not what happens always. There may be a problem with your internet connection and in such a case, switching to different DNS services won’t make much of an difference. But definitely, DNS jumper will make the process of switching through multiple DNS services much easier and quicker.